Studio 101 West hosted yet another Art & Wine Tour in Atascadero, CA on Friday, May 13, 2011. Heidi Franscioni's (from Paso Robles, CA) Encaustic Photography was a hit. Her fine art photography is embellished with pigment infused bee's wax. She and Dennis collaborated on several pieces which were unveiled at the show for the first time. 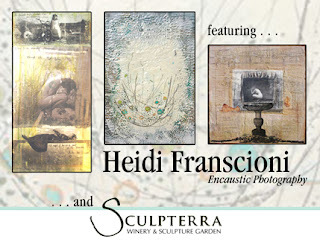 Heidi's work can be seen regularly at Studio's On The Park in Paso Robles, CA. Sculpterra Winery (Paso Robles, CA) featured several of their spectacular wines which turned out to be a perfect pairing for the art of the night. Atascadero's next Art & Wine will be September 9, 2011.